Personal history is so much a part of the people we become later in life; our experiences mold us in a multitude of ways big and small. Nowhere is that more true than in fashion designer, Rachel Roy's life. She recently discussed with Deepak Chopra the important influences in her work and in her life for NEWSWIRE.FM's program ONE WORLD. "My dad is Indian and so I consider myself an Indian woman, my mother is Dutch and I think having that balance of two nationalities in the house...has affected everything that I do both personally and professionally." Because of the mix of cultures in her life, Rachel loves to mix thing in her professional life; fabrics, colors and patterns are all combined in new ways "when things are oddly beautiful that's when I find perfection in it." Despite having the soul of an artist, reality meant that Rachel had to work her way slowly up from the bottom of the industry. She worked in retail from the time she was 14 through college, she interned in mailrooms and worked in marketing departments. "I had to work. I had to balance both sides of my brain," she explained to Deepak. The experience was invaluable. Rachel has developed a business savvy that she would not have, had she been able to move directly into a designer's role. All of her experiences in life have led to her success today. Today she balances her creative designs with a variety of charitable missions. Rachel designs specific pieces to benefit different causes. "Anyone that's given something, it's just your obligation or your right; your privilege to give back." Rachel believes that this is so fundamental that it's like breathing. So she continues to work with charities ranging from those supporting vulnerable children in Africa to those creating trade programs in Haiti. "What I found through clothing is that when you put on the right dress or you put on the right pair of glasses or suit, it can really make you remember what is beautiful about life, and it can allow you to dream. To dream the life that you want to live." That is the joy of the creative process; you have the ability to shape your surroundings not just based upon where you are but with an eye towards where you want to go. So Rachel began designing clothing and supporting causes for the life she envisioned for herself, yet still remaining fully faithful to the life she had already led. Like so much of her life, it's about balance. 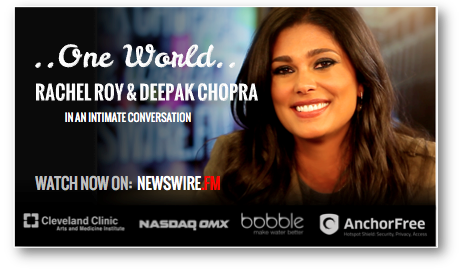 This is a blog series produced in partnership with One World, a video series with Deepak Chopra and NEWSWIRE.FM. To view the full video and subscribe to all the episodes click here.